You have already written much on the subject, so there seem little new to be added. As Robb pointed out, Scrooge should have had plenty of opportunities to earn money in the U.S.A. long before prospecting in the Klondike; he could not pay for everything by working. (7.7) "This silver dollar-- 1898! I got that in the Klondike"
(8.1) "And this dollar-- 1882! I got that in Montana where I punched cows while I looked for a homestead!" The 1899 date cited by Barks was clearly a mistake. Not first dime-related, but on the subject of currency nonetheless (should I have made this a new topic? ), last night I read the "The Year That Was 1996" feature in Uncle Scrooge # 317: "Bruce Hamilton Tells the Real Story Behind The Expert's Gold Coin", which explains how the gold coin on the porcelain statue The Expert got to be made from genuine Klondike gold. The figures on the coin are clearly waterfowls, making it a fictitious currency. This may naturally be because it was deemed cuter, more "appropriate" and more original than using an actual coin. This entailed an oddity: the coin is stamped "City of Duckburg", and its value is "twenty ducats". Is it the logical conclusion of the design with a duck motif (making it a specific currency, with a pun on "duck"), or might it be considered as a souvenir coin from Duckburg (either medal you buy, or a coin that was changed by one of those machines that press "San Francisco" and the picture of a cablecar on the pennies you feed them)? Olivier wrote: You have already written much on the subject, so there seem little new to be added. Scrooge refers to the first dime he ever owned. So, that doesn't necessarily say anything about the dollars of earlier years. This story makes a connection between Scrooge's oldest coin and the first earned dime. But here Scrooge is guessing about the dime, having just discovered it in his pocket. Scrooge says: "it should be". According to 'Back to the Klondike' (OS 456), Scrooge's memory can be so faulty that he doesn't even remember the name of his nephew Donald. So, there's no proof that Scrooge really recognizes the first dime he ever earned, or any other coin. Who can check if Scrooge is right? Is the dollar of Montana really earned in 1882? Did Scrooge really punch cows while looking for a homestead? In Barks's stories, we just have to believe Scrooge on his word. There are no witnesses to tell a different story. The question could in fact be if Scrooge is wrong. Scrooge brags a lot. A lot of knowledge about Scrooge's past comes from Scrooge himself. And in 'The Loony Lunar Gold Rush' (US 49), a bragging Scrooge seems to be telling a lot of errors about his past, given the critical comments from listening Junior Woodchucks. Would that be an error of Barks as well? Or do investigators take Scrooge's recollections too seriously? Egg wrote: Scrooge refers to the first dime he ever owned. So, that doesn't necessarily say anything about the dollars of earlier years. As was concluded earlier and you suggest here again, it is safe to assume Scrooge means this dime was the first coin he had ever earned. Egg wrote: According to 'Back to the Klondike' (OS 456), Scrooge's memory can be so faulty that he doesn't even remember the name of his nephew Donald. So, there's no proof that Scrooge really recognizes the first dime he ever earned, or any other coin. Who can check if Scrooge is right? Good point, but, first, you might consider this was a temporary memory lapse, just like his nervous breakdown is limited to "Tralla La"-- even though the story ends on another fit, Barks never used this again, and in all the other stories, Scrooge has always kept his self-control and calm; he may throw a tantrum, but he faces the music and bears his adversaries, which he could not have in the condition he was in "Tralla La". And then, you might think that Scrooge did actually hold onto that first dime right from the beginning, if it does have the sentimental value he says. He may have tied it to his pocket from the start, as depicted in "The Second-Richest Duck". Of course, one might wonder if this truly is his first dime, for yet another reason: there might have been a confusion of some sort in his earlier years-- mixing up coins, not being sure which it was, and decided it was this one, the point being to have this memento, an object onto which to project such sentimental and ethical values. Or you might understand he is referring to the very first coin he earned in the U.S.A., having arrived penniless, paying for his boat fare by working. Egg wrote: Did Scrooge really punch cows while looking for a homestead? In Barks's stories, we just have to believe Scrooge on his word. There are no witnesses to tell a different story. The question could in fact be if Scrooge is wrong. Scrooge brags a lot. A lot of knowledge about Scrooge's past comes from Scrooge himself. And in 'The Loony Lunar Gold Rush' (US 49), a bragging Scrooge seems to be telling a lot of errors about his past, given the critical comments from listening Junior Woodchucks. Many of his memories have more than a touch of the tall tale. A nice possibility would be to consider he is making this up, not so much to brag, as to educate his nephews. The story and memories may be correct, but he picks a random coin to make his point, emphasizing it by adding this sentimental moral ("hard work is rewarding, and you shall treasure such experiences"). Egg wrote: Would that be an error of Barks as well? Or do investigators take Scrooge's recollections too seriously? As often noted, the problem is that Barks made it up as he went, depending on his story needs, and did not mind contradicting a previous story and moving things around, just so he could tell another story. We are thus bound to run into contradictions, incoherences, impossibilities, unanswerable questions, tough decisions. In 'Billions in the Hole' (US 33) the dime is shown as being a coin that obviously isn't as thin as a razor blade at all. The side of the dime is shown, and looks as thick as any coin. So, the difficulty is not just the date of the dime. The dime seems entirely different from the thin dime in the water tank bin story. And if the stories are taken in chronological order of appearance, then the dime of 'Billions in the Hole' cannot be that thin dime of the water tank bin story. Unless Scrooge had the dime somehow (heavily) restored. So, the differences can not just be solved by changing the dime's date from 1899 to an earlier date. 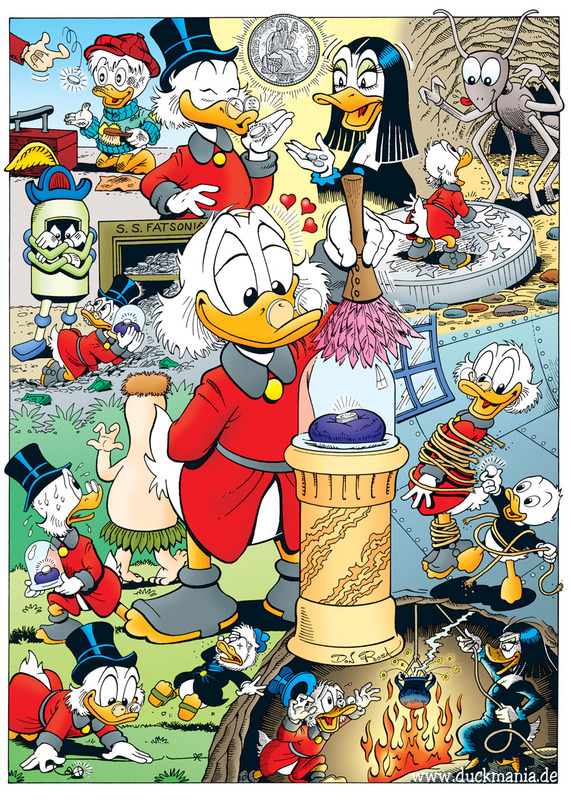 On a poster illustration, Don Rosa suggests that the date of the dime in the water tank story and in 'Billions in the Hole' is the same one. As scenes of both stories are shown, with one dime dated "1875" on top. The picture based on the water tank story shows a nephew cutting through Scrooge's ropes. But the picture based on 'Billions in the Hole' shows the dime being thick like a normal coin. How can this contradicting combination of two different looking dimes be explained? It seems to Egg that either one of the dimes is the real first dime. And so, if the water tank story shows the real first dime, then the later stories ('Billions in the Hole', etc.) show a substitute coin with an apparent late date (1899). So, if Barks is in error, then this has big consequences for what is known about the first dime. It might be easier to conclude that Scrooge somehow choose for a different, better looking dime to be his official first one. Where does Barks (or any of his stories) state that Scrooge's nervous breakdown is limited to the "Tralla La" story? Didn't Barks really use Scrooge's nervous breakdown again? Egg can think of some stories. And where does Barks (or any of his stories) state that Scrooge has "a temporary memory lapse" in 'Back to the Klondike'? How do we know Scrooge's recollection of memories is correct? We have to believe him on his word. And beside that, Scrooge could have taken his pills in later stories. You state that "Scrooge has always kept his self-control and calm", but then you state "he may throw a tantrum, but he faces the music and bears his adversaries". So, Scrooge is not "always" keeping his self-control. And in the Tralla La story, which you mention to be an exception, Scrooge faces the music by leaving Duckburg. So, there he's having self-control. Egg could mention some more stories in which Scrooge is in nervous breakdown condition. For example 'The Golden River' (US 22), where Scrooge gets upset about his money level optically looking smaller. In 'The Strange Shipwrecks' (US 23), Scrooge hits the ceiling. And the fact that Donald nailed a cushion to the ceiling shows that Scrooge is known to get a nervous breakdown. Scrooge's apparent bad health is shown in more stories. It's not a one-time feature, but part of Scrooge's character. Olivier wrote: And then, you might think that Scrooge did actually hold onto that first dime right from the beginning, if it does have the sentimental value he says. He may have tied it to his pocket from the start, as depicted in "The Second-Richest Duck". This dime is not described, as far as Egg sees. Still, one could wonder how a string can be attached to a dime that is sharp as a razor blade. Do you have a complete list of Barks stories with the first dime(s)? Can that be found somewhere? Olivier wrote: Of course, one might wonder if this truly is his first dime, for yet another reason: there might have been a confusion of some sort in his earlier years-- mixing up coins, not being sure which it was, and decided it was this one, the point being to have this memento, an object onto which to project such sentimental and ethical values. Egg thinks it would be more interesting to have a sort of Rosaïstic story about the "Mystery of the First Dime" than any stories/theories which just debunk the thick "1899"-dime. Even if Barks would have been in blatant error, then Egg thinks the sport is to find an in-between way that still makes both options possible. Barks leaves a lot of room to imagine what "really" might have happened, as you describe. That's what Egg likes about Barks. As storyteller, Barks leaves room for imagination. nephew 1: "Unca Scrooge, tell us a story!" nephew 2: "Yes! Tell us a real WINDY one!" Scrooge: "I'll tell you of one of my experiences when I was a miner in the desert!" Olivier wrote: A nice possibility would be to consider he is making this up, not so much to brag, as to educate his nephews. The story and memories may be correct, but he picks a random coin to make his point, emphasizing it by adding this sentimental moral ("hard work is rewarding, and you shall treasure such experiences"). For Egg, this would make Scrooge more human and realistic. Otherwise Scrooge would be some sort of exaggerated Hollywood Rain Man. Egg thinks that Scrooge as bragger telling tall tales is in line with how he first appeared in Barks's stories. In 'A Christmas on Bear Mountain' (OS 178) and 'The Old Castle's Secret' (OS 189), Scrooge is a rich coward having asthma. Contradictions, incoherences, impossibilities, unanswerable questions, tough decisions are all part of real life. That's what makes Barks stories so realistic to Egg. There could be more sides on a story than we can ever imagine. That's why Egg is reluctant in stating that Barks is in "error". Furthermore, if the date "1899" is in error, then any other Barks date could be in error as well. That's a consequence of rejecting Barks as faithful source. This way, the dates of the silver dollars (1882 en 1898) could also be in error. Egg wrote: It seems to Egg that either one of the dimes is the real first dime. And so, if the water tank story shows the real first dime, then the later stories ('Billions in the Hole', etc.) show a substitute coin with an apparent late date (1899). This is too easy and too crude. Because there are more possibilities. A possibility that neither of the shown dimes is the real one. And a possibility that there could be more than two candidates for being the first dime.